A set of colourful house facades. Each different, set apart by their pastel shades. Some of the window sills have iron decorations, others are plain and simple. The yellow house even has some plants outside the windows, while the curtains are drawn across the light grey house’s windows. Despite these differences, there is something curiously uniform about these six house fronts. 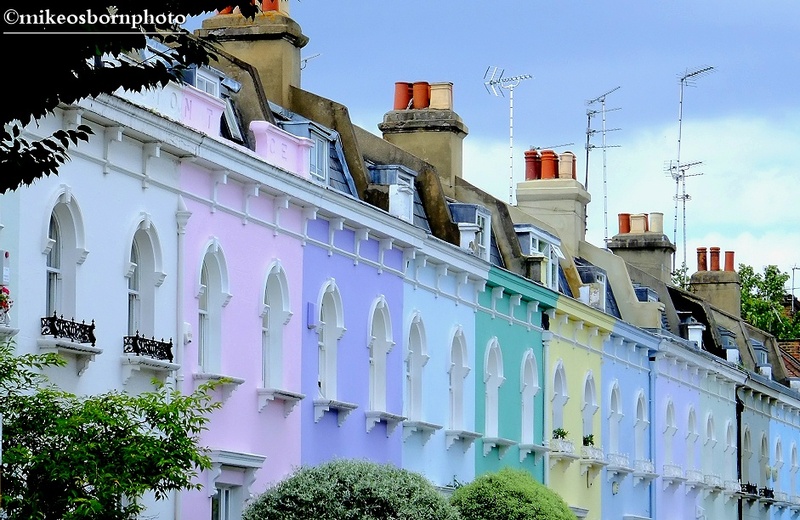 This pretty row sits very close to my home in Hammersmith, west London. The houses prompt you to stop and look at their genteel, candied loveliness. Wingate Road also has another gem on the corner – a lovely pub called the Anglesea Arms. You might call this a traditional local watering hole, which is something to be cherished in the midst of a big city. Wow, for a moment I thought you made these photos on a trip in the Mediterranean. So un-English these pastel colours. Nice! Thanks Cos! No, across the road here in the middle of west London. I’m trying to find out if they were always these colours. Even on rainy days there’s a bit of sun in your street! Great place to live, I suppose. A good splash of colour, yes! And a nice area to be in. It’s little tucked away gems like this that add to the pleasure of travel – even if it is in your own home town! Great spot. Thank you Noeline. Yes, a very short walk away from my post here. While I was taking those shots another guy walked past and did the same with his phone – very eye-catching. Thank you Mike. It’s more like a village than a suburb of a very large city. Utterly gorgeous, both the subject and the photos. How lovely in the depths of a dark, English winter to see a terrace like this every day – if I lived there it would remind me always that spring is coming……sooner or later! Thanks Linda, I think maybe that’s why they plumped for this colour scheme. It must look very inviting on dark days as you say. Nothing like the constant Canarian light and brightness, though! This is beautiful! I love how you put the six window shots together as one larger image, it really got my imagination racing. I too immediately pictures a Mediterranean waterfront lined with these windows. Amazing that they are in the heart of London! Thank you Saskia, it’s very nice to receive your comment. Truly, right here in London and very close to where I live. I’ve had a look at your blog and it’s very beautifully presented with some excellent food photography. The recipes are very enticing too. I’ll be having a closer look soon! Thank you. Food photography is new to me, so I am still experimenting and learning, but having a great time as I go along!!!! It’s a specialised field for sure. Your site looks very appealing, keep up the great work! Well, it’s right on my doorstep (quite literally), so you might even squeeze a cup of tea out of it! Terrific images Mike and the first image would make for an interesting album or book cover. Hope you have a great week. Many thanks James. Now there’s an idea :-) Hope you have a good week – a very wet start here in west London. Dribs and drabs here on the coast. Today its is glorious! It’s proper English summer weather now… not too warm, sunny spells.